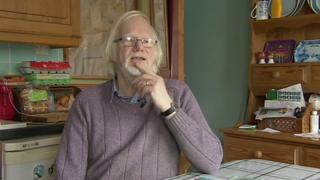 A man read of his own "death" in a letter from HMRC that said his pensions had been cancelled. George Taylor, 65, of Par in Cornwall, said he was shocked when he received the letter at the end of last year, but added he now saw "the funny side". The retired nurse said his state and NHS pensions were stopped immediately and despite contacting the NHS, it only re-instated his payments on Thursday. The NHS apologised for the blunder and blamed an "internal error". Mr Taylor worked as a qualified nurse for more than 35 years and has been receiving a state and NHS pension since he retired in May 2018. On 18 December he received a letter informing him he had died and his estate would need to be settled with HMRC. He called the department and his state pension was reactivated within four days. However, two weeks later, he noticed his NHS pension had not been paid into his bank account. Image caption The first letter from HMRC said it was sorry to hear of the "recent bereavement"
"I phoned them up to inform them that I am still alive, and they told me that they would send it through to their finance people," he said. "I'd phoned them up about six or seven times since and nothing was done until last Thursday." Mr Taylor said stricter and faster checks should be in place to ensure mistakes were not made in future. He said he and his wife had been able to cope financially without the payments for the past few weeks, but that others "may not be so lucky". The NHS said it was given the wrong information, and that payments "were not reinstated as quickly as they should have been".